Detail, Musée du Louvre, Paris. Ms. Ivories A53, f.1 1408. This miniature family portrait is on the first page of a manuscript of Pseudo-Dionysios that Manuel II sent as a gift to the Abbey of St. Denis in Paris. It is usually dated to 1403-1405* but there are reasons that doesn't seem right to me. Theodoros is identified as Despot, and he is wearing -- agreed, there is a lot of wear on the painting -- the four-arced crown that Pseudo-Kodinos says the emperor puts on the head of the despot as part of the despot-making ceremony. His brother Andronikos is identified as Prince, and he is wearing a diadem with no arcs. 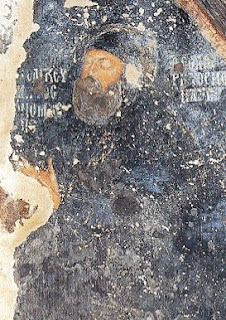 Theodoros was created Despot of the Morea in the summer of 1407 -- a chronicle says his uncle Theodoros I died on 24 June, a date a little suspect since that is the date much more reliably given for the death of Theodoros II as well. However, an action by the Venetian Senate of 27 August refers to the "despotum novum creatum," so he must have died around that time. Sphrantzes Somebody tells us, not Sphrantzes -- that Manuel went to the Morea, and I think it is safe to assume he created Theodoros Despot then. ** That gives two months for Manuel to learn of his brother's death, make the trip to the Morea, and then for news of the ceremony to get to Venice. "dominum despotum de novo creatum"
Theodoros was about 9 years old at the time, and he had been in the Morea for several months already, watching his uncle die from gout. Manuel described his excruciating pain, his inability to use his limbs. The painting of Theodoros I at Mistra shows him grossly swollen from progressive renal failure. He must have died from kidney failure. The child Theodoros saw his uncle's pain, saw his friends tending him as if he were a baby, smelled the growing sores from the gout, the odors from the kidney failure. It was a harsh beginning for a bright and sensitive child, and it explains the end of his life. Andronikos was created Despot of Thessaloniki after 22 September 1408, the date his older cousin John VII of Thessaloniki died. He was not quite 8 years old. John should have been succeeded by his own son Andronikos, but Andronikos died earlier in the year. Sphrantzes tells us that Manuel took Andronikos to Thessaloniki and created him Despot there. ** It is a nice, literary, effect: Manuel replacing a Theodoros by a Theodoros, an Andronikos by an Andronikos, but it seems a hard thing to impose on small boys. So I believe the family painting was painted after the summer of 1407 and before the fall of 1408, which fits with the 1408 date of the gift of the manuscript to Paris. Another thought: Manuel -- and John who is not shown in the detail -- is wearing black. I believe Manuel is depicted wearing mourning for his brother. I have seen only two mentions of what he was wearing at particular times: both times white. 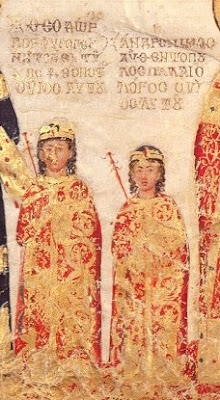 Pseudo-Kodinos says the emperor wears white or yellow for mourning, but many details of the imperial court can be seen to have changed between P-K and Sphrantzes. Black was the usual Byzantine color for mourning, and it was the usual color for mourning in the West, where this manuscript was going. I cannot think I am the first person to note these details: I would be grateful for any references anyone has that confirms them. ** A description of the ceremony to create a despot is here..